There. I’m glad that’s done. Because we all know a girl cannot properly celebrate American independence unless she is fully accessorized. *UPDATED TO ADD* Thanks so much for all the crafty compliments, which of course was just what I hoped you’d say was completely unnecessary. *grin* Several of you asked how to make these. I’d love to tell you, but it’s a closely-guarded trade secret taught to me by my bow-making mentor; if I were to tell, you the Bow-Making CIA would show up at my house and confiscate my hot glue gun. What I can tell you is that there are many bow-making tutorials for sale on-line–I have one of them, and it is not terribly hard to teach yourself. Really, it’s not. Those are adorable! Can I ask what kind of barettes you use underneath on those? My three year old finally has enough hair to be interested in cute hair bows! These are absolutely adorable & they look “professionally” made 🙂 Maybe you would consider posting the directions on how you made them or even make a video on UTube giving us the step-by-step directions. You didn’t have anything else to do, right? Thanks for sharing! Where do you find curly ribbon like that? I’m also interested in what type of clips you used. My 20-month old loves bows. I love the way her mouth looks when she says “bows.” I LOVE HAVING A GIRL. Well, good grief…how crafty are you?!? I had no idea of your talent! and seriously, weren’t you just saying you were NOT crafty? lies, all lies! Sweet! Awfully crafty of you – how did you hide your talent so well? ADORABLE! A whole lot better than the red rubber band I was planning on sticking (very literally) in my daughter’s hair. You have shamed me into coming up with a fancy alternative..
Super adorable! They will be the pride of Independence Day! When my daughter was younger we had a book whose main character wore “crazy bows in her hair.” Because I alway emphasized the “CRAZY” when I read the book, I created a phobia with my daughter. She thought something was wrong with the bows. No just her “CRAZY” mother. I’m glad your daughter will tolerate cuteness! WAY CUTE! I’m inspired but have no idea how to begin. Please post directions on how to make that curly ribbon. My little one’s hair would hold these. HE is young enough that he wouldn’t notice. DH is out of town; bring on the bows! They are that cute. Oh they are gorgeous! My girls used to always wear beautiful bows like this when they were younger-thanks to my very crafty sister. For independance day and other colorful holidays, I’d paint their nails in red,white, and blue, and add fireworks decals or whatever was appropriate for the holiday. I love girly things! So cute. My 6 year old daughter refuses to let me put anything in her hair, but she might change her mind if I could make such cute bows. Oh wait, that would require me to have some craft talent which I don’t have very much of, hahaha. Beautiful bows!! Those are gorgeous! You did a spectacular job. Adorable! 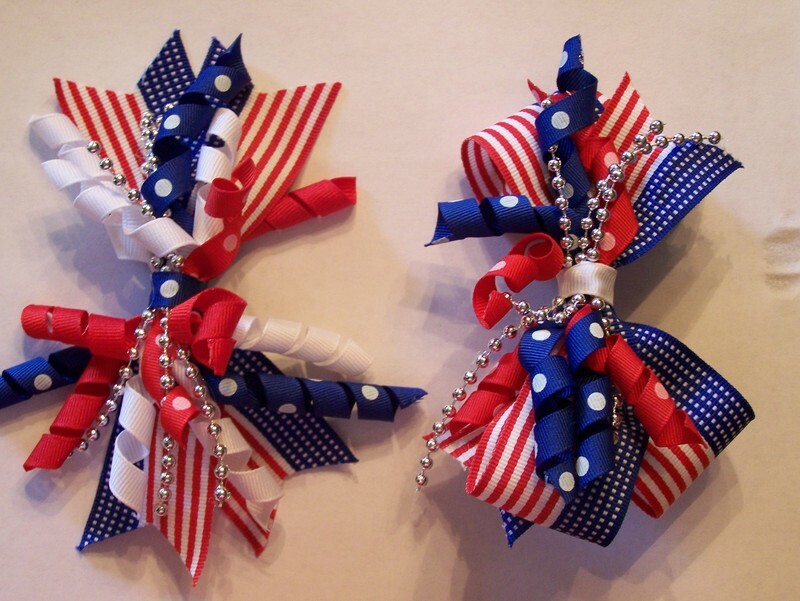 Your little girl will be well accessorized come July 4th! Cutie, cutie pies. Love your craftiness, and it’s not shameful to plug for compliments. I happily give them, especially for something as darling as that. Looks like that one could be on the site as “Firecracker”. Well done! Shannon. You are the rockin’ bow mama. Very nice work! I’m beginning to make my own jewelry. I’ll have to post some on my blog. Those look great! Good job, girlfriend. And here is the reason I pray God blesses me with a girl…someday, accessories, especially bows!